"I love the sweet, expectant nothingness of an empty page." Wixie is a digital canvas that students can use to combine their writing, their voice, and their art. Wixie gives students tools to demonstrate their understanding in the classroom as well as share ideas, express themselves, inform others, and change minds. 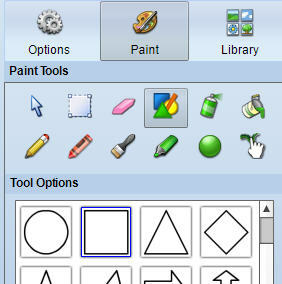 To use a blank canvas in Wixie, simply have students log in and click the New Project button on the toolbar. If students haven’t used Wixie yet, they will automatically begin at a blank canvas! Here are seven ideas for Wixie projects that will get your learners comfortable starting to create from a blank canvas. Constructing their own models and diagrams requires higher-order thinking skills and helps students organize and better comprehend information. This type of performance task also helps you evaluate student understanding. 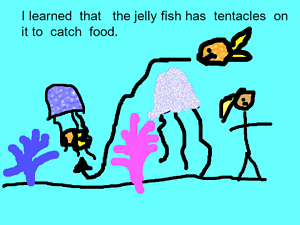 Even young learners can easily create and label their own illustrations that show vocabulary and science processes. Have them click the Paint button for access to a panel with paint tools and options. They can add text labels with the Text tool on the toolbar. Young learners enjoy using the freehand paint tools. 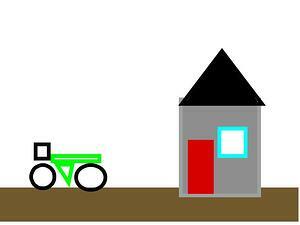 Once they have mastered these tools, challenge them to draw a picture using only the Shape tool and its options! To give students a bit of direction, ask them to paint shapes to create a picture of a house or even a favorite activity. A blank page project is also a great way to get students to respond to literature and informational text. Young students can simply use the Paint tools to draw a scene and click the Record button on the Options panel to retell key ideas and details (Common Core State Standards for Reading Literature and Reading Informational Text K.2 and 1.2). As they emerge as readers and writers, they can use the Text tool to share their opinion about events in the story or even write letters to the characters. As they develop in their writing and Wixie skills, their blank-screen projects can develop into multiple page writing projects. Students simply click the Add Page button on the toolbar to add additional blank pages to their projects. They can use the green navigation buttons at the bottom of the interface to move between pages as they are working. The Common Core State Standards look for Kindergarten learners to engage in narrative writing that uses "a combination of drawing, dictating, and writing to narrate a single event." As they move through second-grade, they are expected to progress to writing that narrates "a well-elaborated event or short sequence of events, includ[ing] details to describe actions, thoughts, and feelings, use temporal words..."
No matter what their level, Wixie makes it easy for your emerging writers to illustrate, write, and narrate an original story. Young students are also capable of writing valuable informational texts too! As your emerging readers begin research using informational texts, ask them to create their own eBook to share what they have learned. Creating informational eBooks also helps students better recognize and use the features of non-fiction like headings, images, and a table of contents. Asking students to create a book that someone else will use motivates them to write more and edit more. If you have them edit carefully, you can even use the resulting work as leveled-informational texts for other students to use! You can make this digital text easily available by posting a QR code to the project URL in your classroom or media center. When students want to learn a new skill, they will likely head to YouTube to watch a video tutorial. Many of these are even created by kids for kids. Encourage your student's informational writing skills by asking them to create their own step-by-step how-to tutorial in Wixie. Since Wixie works online, student work is published instantly, simply share student work in Wixie by sharing the project URL in an email or tweet or by embedding the project in your classroom web page. Get a complete Writing How-to Informational Texts lesson plan. There are lots of ways to incorporate blank-canvas projects into your curriculum. As students first encounter that blank page, you may need to encourage a few of them to get started, but as they get older, they will see that blank page as not an obstacle, but an opportunity to showcase their ideas and share their passions with the world.